We would like to thank you very much for your generous donation and support to the 2011 March earthquake and tsunami victims. We are certain that your contribution (even small one) has made a significant difference. However, individuals who have been affected by disasters (not only in Japan but also in other countries) need long-term support. As the affected individuals often become invisible and forgotten after a while, we are committed to keep raising awareness and disseminating the information and work done by other dedicated individuals and groups. We will keep doing our best. Please follow us and check out our our friends’ recent activities on our Facebook page. 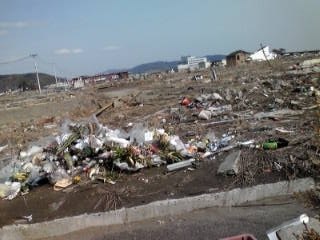 It has been more than a year from the earthquake and tsunami happened in Tohoku area. When you go to Tokyo or even Sendai, you cannot see dramatic damages any more. They recovered pretty quick. 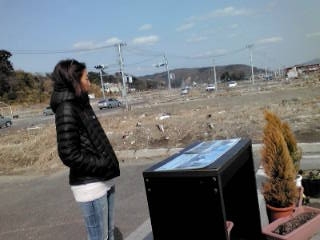 However, Ishinomaki city where tsunami hit is still on the long process. One part of the city looks empty. There are rusty clocks on the school and the kinder garden’s building stopped at 3:40 p.m. which was the tsunami hit. There are still many houses that are waiting for being demolished. It feels very different from the pictures that you can see on the magazines or newspaper. I couldn’t say any word in front of this site. This area (picture above) was a business district. There were many stores on the street. Even though many people are working so hard to make this situation better, this area has changed just a little little bit from a year ago while major city has been recovered. People are still struggling from the tsunami. We shouldn’t forget this. Not everyone can do volunteer, but we can do something to support. Donating money, writing about this in your blog, or reminding someone. People still needs help. This place was a store which was selling kitchen facilities. You can see the floor but no building. Special thanks to Kristi and future kindergarten teachers! 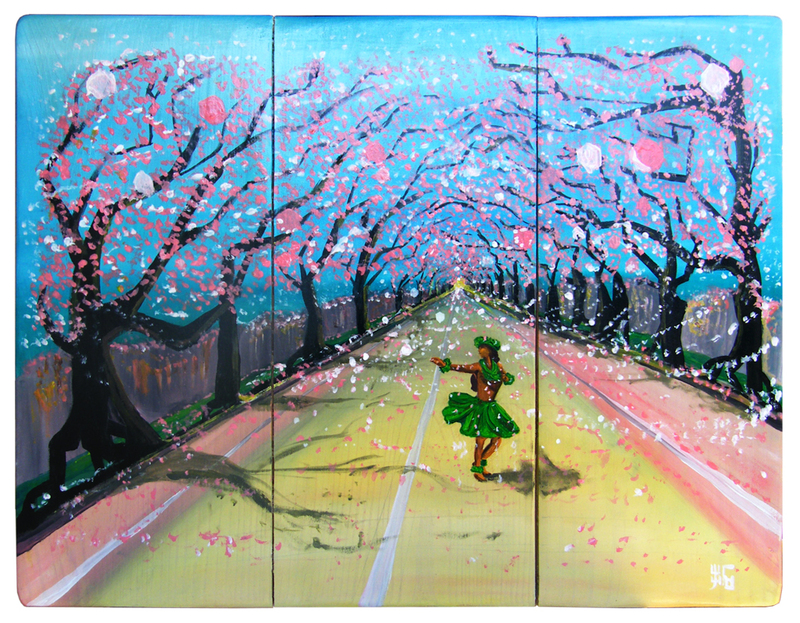 I have been inspired by the Tomoe Project’s contribution to Japan since the International Festival at CSUSM. Since then, I have actively participated at the Encinitas Environment Day and spread the word to family and friends about this cause. Being a part of Team Tomoe has given me the opportunity to make a difference. I am so honored to be a part of this team and to have met such wonderful, dedicated people who are so passionate about this cause. They truly inspired me to continue to reach out and what better way than to educate my fellow cohort members–future educators. 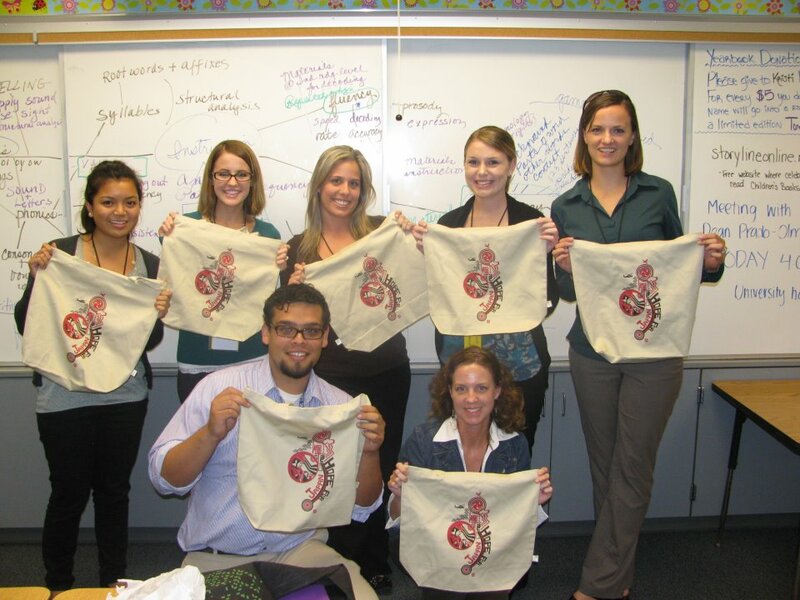 The CSUSM Bonsall Cohort is a group of graduate students who are pursuing a career as elementary educators through the multiple-subject credential program. A part of our College of Education mission statement at CSUSM is to prepare thoughtful educators committed to diversity and ongoing service. We are huge advocates for multiculturalism, and we feel it is important to be aware and understanding of different cultures. I informed my classmates about the Tomoe Project, and they were inspired and interested to help support this great cause. I had suggested a $5 donation, but we went above and beyond and raised $200 for the Tomoe Project!!! I was overwhelmed by their generosity, considering some of us are working full-time and going through this 40+ hour week program on a tight budget. We feel that it is important to educate and support causes like these, so we can pass on our knowledge to educate our students. We, the CSUSM Bonsall Cohort, have become like a family. I feel like Team Tomoe is also like a family. From one family to another, we wish the best to all those affected in Japan. Our thoughts and hearts go out to them, and we are firm believers that through education, we can educate people to become more aware and understanding of situations like these. Just because disasters are over doesn’t mean that the people of Japan don’t still need our support. 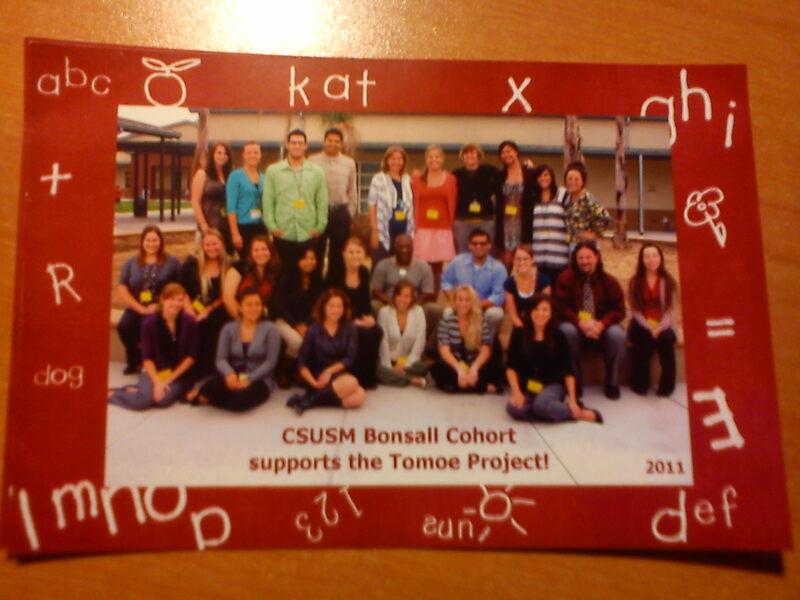 We would like to thank the Tomoe Project for starting this organization, and we, the CSUSM Bonsall Cohort, will continue to spread the word and educate others. Thank you very much, Kristi! We love you all very much! We would like to THANK YOU for your supporting. We finished selling our Tomoe products by end of September. Everyone had been very thoughtful, helpful and cheerful. It has been about 7 months since the tragedy. It feels like it happened just last week, though… We are working on reminding dudes that people in Tohoku area needs help. The way we can do might be a little different from the beginning, so we are still keep going! And also there were more earthquake and huge typhoon. What is wrong with Japan???? We really have to be strong, just like Nadeshiko Japan! Hey Friends!! How’s it going?? It has been long long time for Tomoe Project not participating local events. 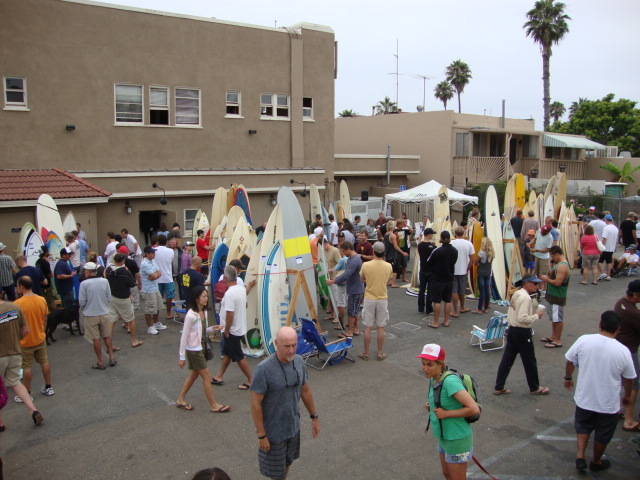 There is Cardiff Surf Classic & Rerip Green Fest today(9/17) and tomorrow at Seaside Reef. 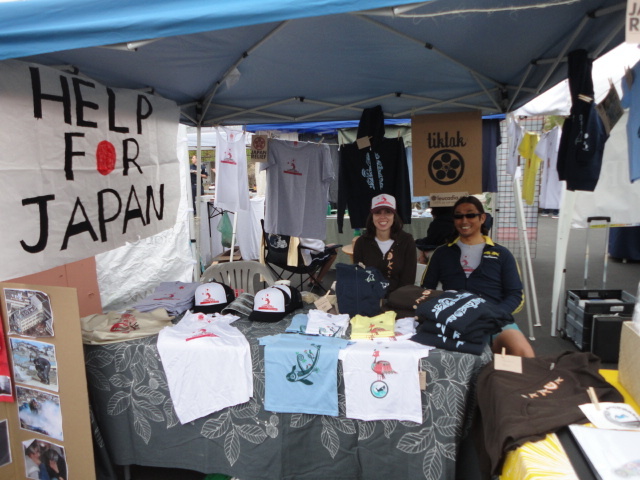 We had CA Bear goods and Eco bags to help Japan. It was overcast and a little chill in the morning:( but sun came out in the afternoon:) Seaside Reef parking lots are so big, and there are many booths there. One of the booths were giving away free mustache. Yes! It looks so natural with Noah… it’s the best fashion today. We are sharing the booth with our designer, Studio Auto, who also designed the event tees for last year and 2 years ago. It has been about 6 months since the tragic earthquake and tsunami… People are still struggling from their situation. Of course, it is recovering a little by little; however, it takes almost forever to get close to normal. 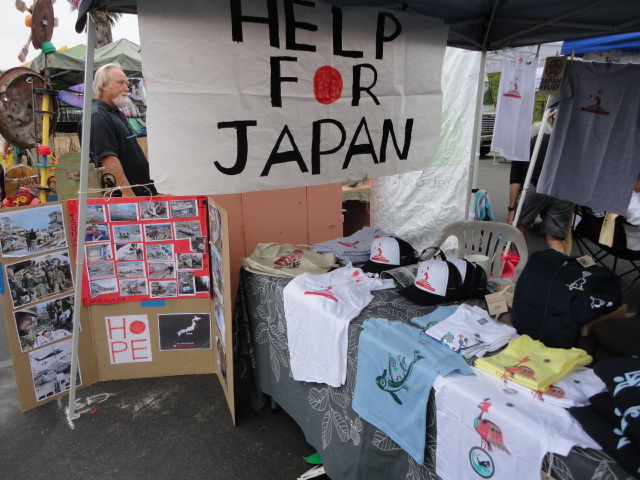 We already donated about $7000 of money, arts and clothing to support the victims and volunteers in Japan. Your contribution makes people, who lost so many things happier. Huge thanks to all of you!!! How are you? We haven’t updated this website lately but we are still doing donation activity. 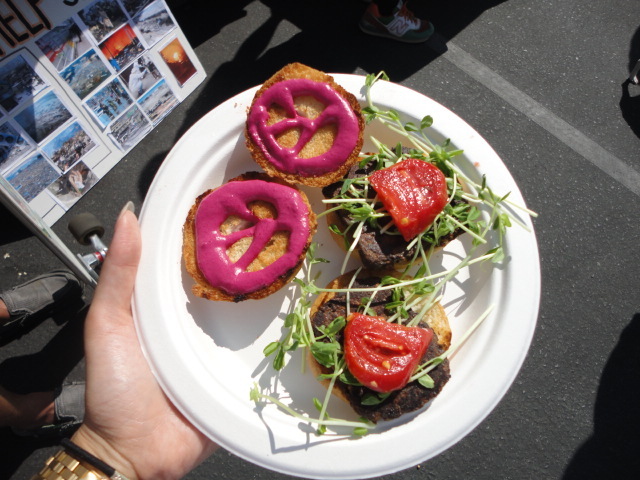 We participated the Board Swap at Patagonia Cardiff on last Saturday, July 23. 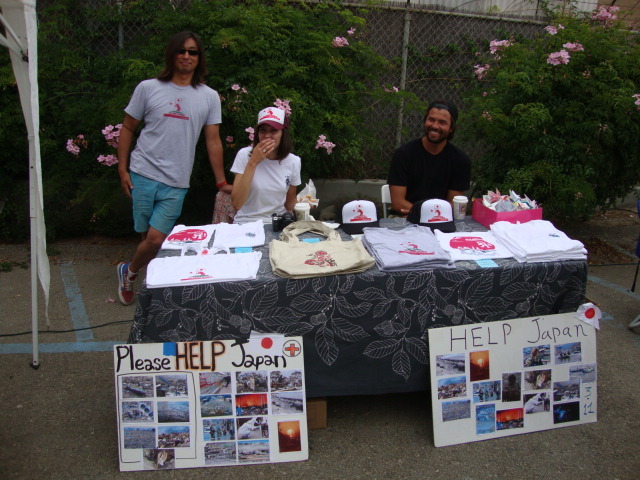 Patagonia provided space for local surfers to sell or trade their boards, and also for us, Tomoe Project, to sell our products! The Board Swap and Tomoe Project were both successful. 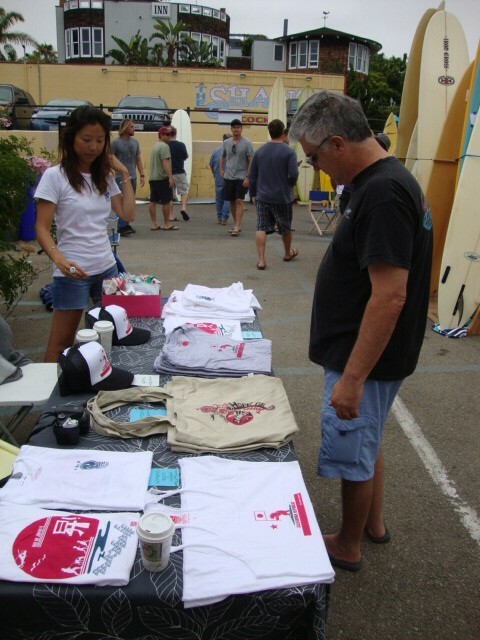 There were a lot of people buying nice boards, like our designer :), making money from used boards, and helping us by buying our donation goods! Many thanks to Patagonia for cooperation!! It was beautiful and HOT day, not like last summer. We were almost melted under the strong sunshine before we got a tent. We appreciate that people still care about Japan. We sold many items that day. Few people came to our booth and just gave us some money for donation. I just received an email from our friend in Japan who lives in Miyagi, a town close to Minami-Sanriku… 3/11 was his birthday… here is his email, describing his experience on that day and what he has experienced since 3/11. Thank you very much indeed for the heart-warming mails and contacts you have kindly sent and made us this time. 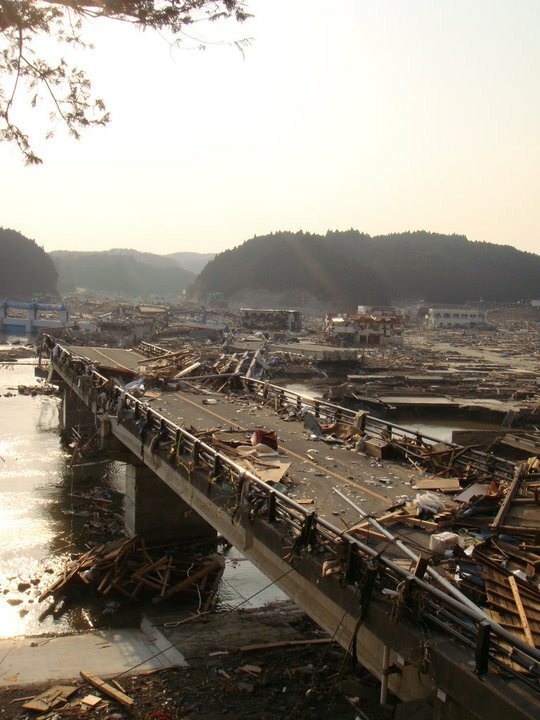 The quake and the ensuing tsunami that happened on March 11, my birthday, have changed many things completely. That day, I was happy to receive your mail celebrating my birthday. The earthquake occurred immediately afterward, approximately speaking. I was having some preliminary discussions with my shop manager. Initially, I thought it was a usual one, nothing serious. Gradually, the shaking became greater and greater, however. We tore down the stairs. At the bottom of the stairs, in the parking lot, we saw many people, i.e. my employees and customers, running this way and that to make their escape, crying. The ground cracked, and, as it shook, the cracks repeated opening and closing. Immediately, the power failed: Signals stopped working, and all our lifelines, to say nothing of the cell phone, were cut on the instant. Back in the office, we found all the machines, including the computers, had stopped. Reopening for business was out of the question. About two hours after the quake, which occurred around 2:45 in the afternoon, we received a report that this time a tsunami was hitting coastal towns. 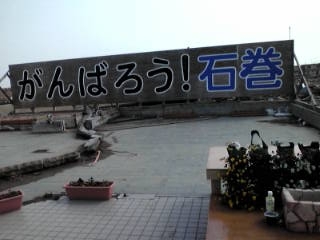 It said that even at places fairly removed from the seashore, the tsunami reached close to the fourth floor of buildings. No one believed it. Then, night fell and the darkness settled. Looking around at near-by homes, most of the people slept in their cars to warm themselves because it was very cold inside the house due to the power stoppage. We also passed the night in our cars, watching TV. It showed how the tsunami had caused fires in industrial complexes and how the seaside towns became engulfed in flames. One of my employees was from the affected area. Frustrating my attempt to stop him, he started for his parents’ home. On that night, I remember, the sky was spangled with stars beautifully, more beautifully than I had ever seen. The day after. I went to the office and, taking an employee with me, headed toward “Minami-sanriku” on our bikes. There, we saw a vast, unbelievable sight. It was like a picture of Hell. The whole town had been completely effaced. On the few concrete buildings that had remained, bodies were hanging from windows. Survivors were in blank amazement, with their eyes glued on their town, which had been lost. Where the tsunami had struck was strewn with hats, glasses, chairs, photo albums, shoes and various other things that got it home to us that people had lived there before. When I saw a red school rucksack that had been estranged from its young owner, my heart was ready to break. All the public institutions, including the police stations, town hall, and hospitals, had been entirely destroyed. When we came to the place where the beach had been where we had used to enjoy surfing, we saw a stretch of about 500 meters sunk to the bottom of the sea, with the possibility totally eliminated that one can sense there once were the sands there. Why could such thing happen? …… I can’t believe it has actually happened, not even now. For three months following the day, I’ve made rounds of evacuation sites almost everyday, supplying tsunami victims with support materials. Now, after three months, I’m thinking of going forward.